This page describes how to use the Axisbase building blocks. The information is condensed to the essentials needed for end-users. If you are a developer or are building your own building blocks or code, refer to the how-to section of the documentation. Depending on how your database was setup, there may be one or more sections in the navigation bar. 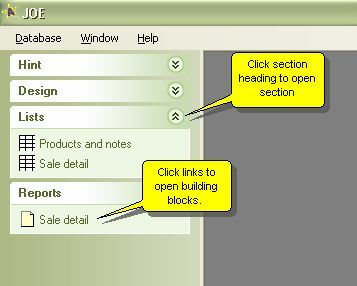 Open the sections and click once on an option to open a building block. A building block is a data subset, list, graph, window, or report. Move the selection with the arrow keys. The left and right arrows always cycle through all available cells in a row, even if they are positioned in a vertical list. The up and down arrows will move between rows. To extend the selection click and drag with the mouse, or press Shift while moving with the arrow keys. Use Page Up, Page Down, Home and End to move by pages or to the beginning or end of the list. To export selected rows to a file, press E or choose Export Selected Rows from the Selected menu. The export format is compatible with Axisbase imports or another tool that understands XML. To reload data from the database, press L or choose Reload Data from the List menu. This is useful if other users have changed data since you loaded the list. To resize a cell, hold down Ctrl and repeatedly press the arrow keys until the desired size is reached. If the list contains a nested list showing detail data, you will notice that the selection can either be the complete outer cell containing the nested list, or one cell in the nested list. Press Enter to select a detail cell, and press Esc to select the outer cell. Or click on a detail cell to select it. If you have a long list, it is useful to sort it (change the order rows are displayed in), or filter it (hide some of the rows). All sorting and filtering is temporary and just affects the current display; none of these changes affect the saved data. There are four commands that initiate sorting and filtering. You can memorize the shortcut letters S, R, T, and F.
Show rows with this value (T) - hide all rows, except those with the value of the current row/column. Think of "This value" for the letter T.
Choose values to show (F) - hide all rows and display the available values of this column. Think of "Find" for the letter F.
If you don't remember the shortcut keys, click on the triangle in the corner of the selected cell, or right-click in the cell, or press the Windows context-menu key on the keyboard. Once you have a column name in the upper left, (either with the values showing or collapsed) there are several things you can do with it. To sort or filter by a second column, move to another column and repeat the sort/filter command. Axisbase will add a second sort/filter indicator in the upper left. To end sorting and filtering, press 0 (zero) or select Remove Filters and Sorting from the List menu. To move the focus between the filter bar and the list, press Tab. To expand a focused filter bar, click on the column name, which is shown as a hyperlink. To collapse a focused filter bar, press Enter or click on the up-arrow icon. The filtering is still active; use this to maximize the amount of screen space available for the list itself. To remove a focused filter bar, press Esc or click on the red X icon. To jump to a row value in a filter bar, start typing the value, or use the up and down arrows. Use Shift + up/down to extend the selection. Only rows whose value matches the selected values in the filter bar will be displayed. Press Enter or double-click on a cell to start data entry mode. Press Esc to switch back to browsing mode. Unlike some other systems, the Esc key does not undo changes; it simply changes the display mode. Left and Right arrows: In browse mode, moves between cells; in data entry mode, moves letter by letter. Ctrl + Up and Down arrows: In browse mode, changes cell size; in data entry mode, moves to next/previous row. Enter: In browse mode, starts data entry; in data entry mode, may open an editor feature (depending on the type of cell being edited). Notice that as you change cells, the Change menu becomes highlighted and counts the changes you make. Undo Selected Rows (U): Reverts the selected row(s) to their original state. All columns are reverted. You can't revert just one cell at a time. Undo All Rows (Shift-U): Reverts the entire list to its original state. This also restores deleted rows. Commit Changes (M): Writes the changes to the database. After committing, the Undo commands are no longer available. Massage whole column. This command is available in the context menu. All rows in the data set are affected, except those hidden by a filter. (Prior to February 2008 versions, the hidden rows are also affected.) For the find/replace massage, you can either replace the value in every row or find/replace text within cells. You have the option of using a formula for the replacement text, so that you can use values from other fields in the row in an expression. See Expression syntax. If the cell being edited is defined as a string (text), enter the text. Pressing Enter will insert a new line in the text, even if the entry field is shown on only one line. If the cell is a date, press Alt-Down arrow or click on the down-arrow icon to open the calendar for quick date selection. If there are a small number of options to choose from, they will be visible in the drop-down list (press Alt-Down to open). Or, if there are too many to display them all, any recently used option will be shown. Press Enter or press the ellipsis button (...) to open a search window. From there, enter the first few letters of the record to search for and press Enter. The list of matching records will be shown. Click on the correct one, or move to it with the arrows and press Enter. If the cell is a checkbox, click on it, or press the spacebar to check or uncheck it. Some windows can have the option to enter parameters. (Namely, the data subset, list, window, or report windows.) Parameters are values you enter to control which record(s) are loaded for display. For example, if you are asked "Show which customer?" you could enter some letters, and only customers whose names start with those letters would be displayed. The letters you enter are the parameter value. If you navigate to a window that requires parameters, you will be asked to enter them. If you have already entered them and want to change them, press the "Enter parameters" hyperlink as shown here. If you check the box, you can enter the parameter; otherwise the parameter is hidden. This may not be available depending on how the database was set up. If you proceed with the box unchecked and no value entered, the search restriction will not be applied.